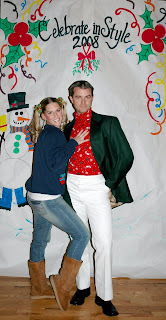 Some friends of ours had an Ugly Christmas Sweater party the week before Christmas. The DI was picked over already, so I went to my in-laws for help. 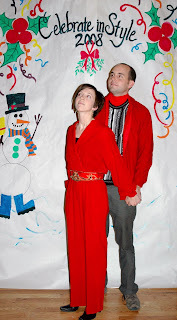 My mother-in-law sewed this beauty of a red jumper/pant-suit herself about 20 years ago. I believe I heard her say she looked all over to find the right belt (and oh did she find it!) and finally found this beaded belt in Park City. I won the prize for "Ugliest Ensemble" by the way (I'm afraid the photos don't quite capture the full glory). You should have seen the purple, red, and gold super-puffy coat I wore with it. Enjoy our cheesy prom pictures below. Ryan was dying to find a dickie (who is old enough to remember those? 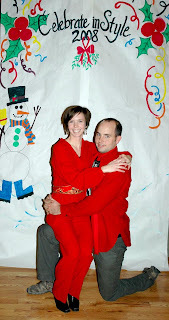 ), especially because of his love of the movie Christmas Vacation. Fortunately, his parents came through again. He couldn't find a thin white sweater, so he settled for this black and white fashion no-no from his dad's closet. 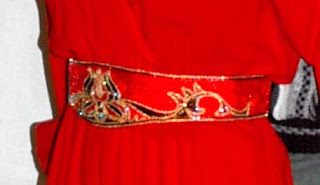 Close up of my belt (made with hundreds of tiny shiny beads). 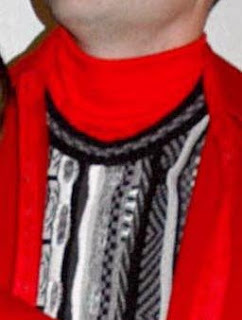 Close-up of Ryan's dickie and sweater. Friends toasting eggnog: Rihanna's sweater is hidden, but check out Dan's white pants and printed turtleneck. And oh my you should have seen his dance moves to the karaoke. Oh my. That looks so fun! Nice that you included spouses. 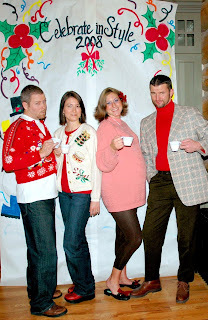 We're thinking of doing an Ugly Christmas Sweater party in July this year! Can't wait. In response to Patti's question in the next post, a "dickie" is a mock turtleneck that is only the neck part and enough to tuck under a sweater neckline. No sleeves, no body, just the neck part. Oh yeah baby. You make red look GOOD!